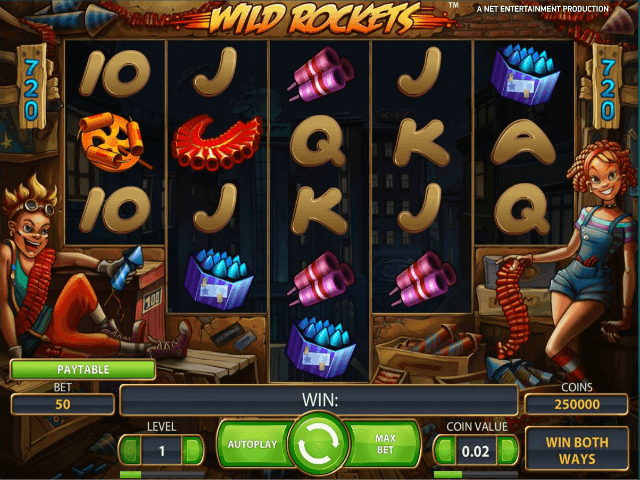 The Wild Rockets online slot machine is an explosive game from NetEnt that packs plenty of power. Celebrating the magic of a firework display, this title offers 720 ways to win with each spin of the reels and an assortment of special symbols and features. If you can land the game’s standout prize, which is 50 free spins, every day will feel like a party given the cash sums that can accumulate. 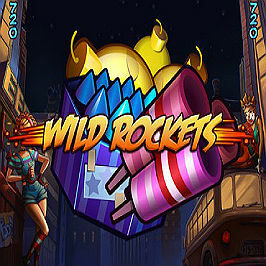 Featuring NetEntertainment’s famed graphics and soundtrack, the Wild Rockets slot delivers plenty of bang for your buck. Play Wild Rockets for Real Money! The slightly unusual-looking reel set, which is in a three-four-five-four-three formation, is home to a fantastic range of features, not least the ability to win from left to right and right to left courtesy of the 720-ways-to-win system. Each and every spin of the reels has a heightened sense of expectation as a result. As ever, three or more matching symbols (10, J, Q, K, A) is the aim of the game to trigger the Wild Rockets slot machine's basic pay-outs. The next set of icons are all fireworks, ranging from powerful rockets to explosive Chinese bombs. The prizes are on offer here are higher, with values increasing from Blue, to Purple, to Yellow, to Orange, to Red. 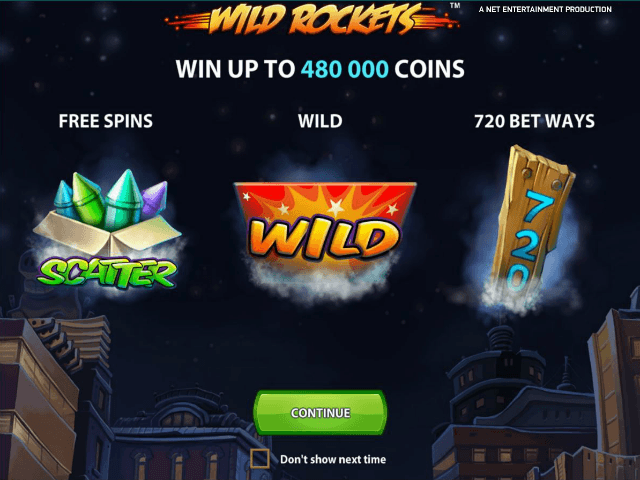 As the Wild Rockets slot game features Win Both Ways technology, there aren’t any paylines as such and so this can't be modified by players ahead of each spin. But you can certainly ensure that each wager you make is the exact amount you want. Set your coin value using the up and down arrows (denominations from 0.01 to 0.50 are available), and then edit this further, should you wish, by opting for a bet level from one to four. 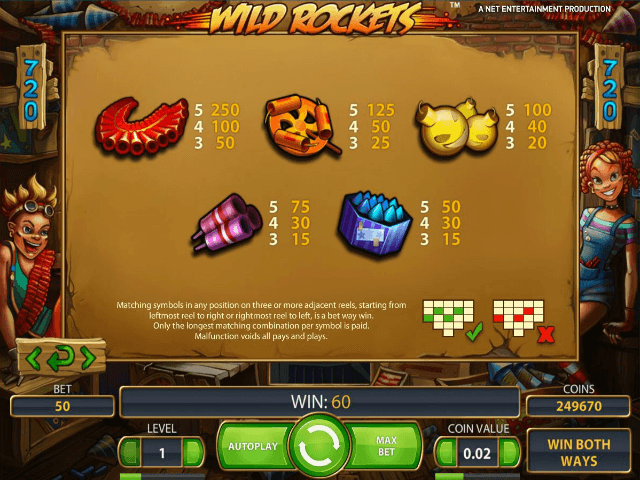 The Wild Rockets slot game also features autoplay and max bet buttons, which ensure your gameplay is as smooth and quick as possible. There are two more features to Wild Rockets that will mean your gaming goes with a bang. First is the wild symbol, which is the triple set of rockets. This can appear on the middle trio of reels, and substitutes for all other icons apart from the scatter. It also has the handy knack of turning all other characters on the reel – above or below based on the direction of the rockets – into wilds, with cool accompanying animation. Secondly, there's the scatter symbol, and three or more of these anywhere on your reels will trigger the free spins bonus round. They also pay out a handy little earner on the side, with five scatters leading to 200 coins and 50 free spins. So why wait for Bonfire Night or a special occasion to light the fireworks? With the Wild Rockets slot every day can be a sparkling celebration. Share this Wild Rockets Review today! 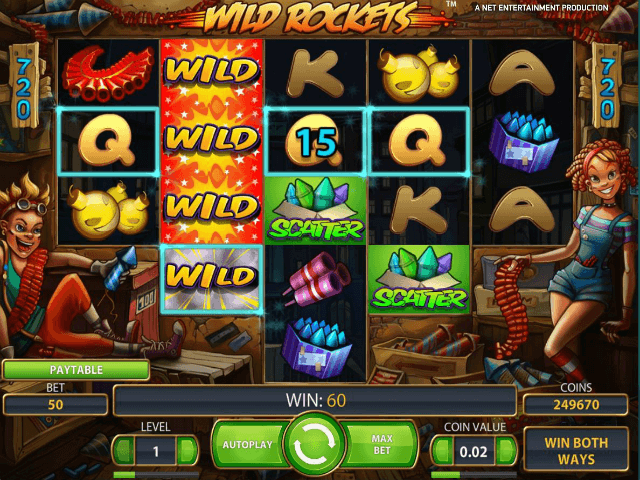 If you like Wild Rockets, you'll love these slot titles too!